Keysight is the leading supplier of radio channel emulators (also called fading emulators or fading simulators) for commercial communication standards, Over-The-Air testing of MIMO terminals and MANET applications like V2X (Car to Car and Vehicle to Infrastructure) and tactical radio communications. Keysight bought the Propsim business of Anite in 2015. All those effects can be reproduced bit by bit with a Keysight radio channel emulator. White Paper in English "Beyond Conformance Testing in 3GPP LTE". This White Paper gives an introduction to LTE technology and describes how LTE products, systems and applications can be tested in a realistic environment in the lab - and thus reproducibly. Fraunhofer's Heinrich Hertz Institute is using the Keysight Propsim F8 for Car2X and Car2Car simulations. With the Aerospace option for the Propsim F8 velocities up to 40000km/h and signal delays up to 1.3 seconds can be emulated. With the Aerospace option you can define flight routes and simulate them. Aircell Success Story: Aircell has equipped more than 600 airplanes with its Inflight Connectivity Solution. 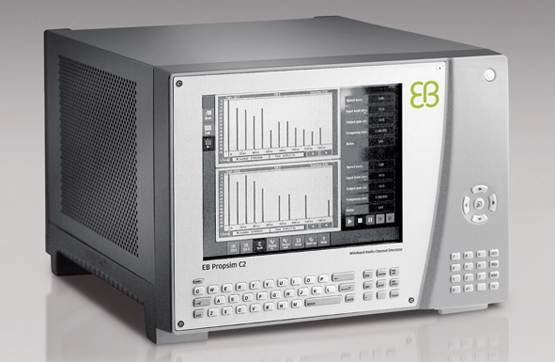 The Propsim F32 is the radio channel emulator with the largest number of RF and fading channels.